February 9 November 20 Dennis Freeman Jr.
SACRAMENTO-Early in the season, the Sacramento Kings played as if they had a great offseason. They came out hot from the start. The new established “Big Three” of Rudy Gay, DeMarcus Cousins and Darren Collison seemed to be a great fit. The teams assist/ turnover ratio reflected the way the team shared the rock. Everyone played like they bought into the philosophy of their head coach. However, after an injury to Cousins and the firing of coach Mike Malone, the Kings seemed to have fallen apart. Heading into the NBA All-Star break, the Kings are still looking to find their identity. DeMarcus Cousins, however, is a big piece to that identity. As the Kings celebrate Cousins being named to his first NBA All-Star game, they looked to end a three- game losing streak against former teammate Isiah Thomas and the Phoenix Suns Sunday at Sleep Train Arena. The Kings went to battle without two of the “Big Three” on the floor-guard Darren Collison and small forward Rudy Gay. In a league that has been taken over with outstanding point guard play over the last few years, Collison brings a defense of presence to the Kings,. Gay has an effective mid-range game in which earned him being a part of Team USA this past summer. The core of this group is something Kings fans should get excited about. First and foremost, the team has a foundation of playing a big man who plays physical on both sides of the floor in addition to his inside outside game. On the wing, the Kings now possess an athletic scorer that can knock down shots from all angles on the floor, not to mention his explosive vertical that can ignite the crowd on any given night. The third piece is a pass first point guard that can pressure the ball the length of the court. We just don’t see that type of defensive intensity at this level anymore. The opposition point guard is in for a long night when Sacramento is coming to town. Aside from these three talented players, they are surrounded with young players, eager for an opportunity to prove themselves. The team just needs a few more bench players and some veteran leadership to be a serious contender in the Western Conference. In order to pick up the win against the Suns, the Kings needed another double-double performance from Cousins, the team’s leader and anchor. And he appeared ready for the challenge early on, scoring 14 points and grabbing seven rebounds in the first half. The Suns are small on the block and that played to the Kings’ strengths. Cousins is arguably the best center in the game today. If not for the teams recent woes, Cousins would be a first team All-NBA selection. Matchups are very important, and the Suns didn’t seem to have an answer for Cousins. I hear a lot of chatter about the attitude about Cousins, but to me I want a guy that’s going to play when he’s emotional, some “bully ball” if you will. That lets me know that he’s a competitor and that he cares about winning. You need emotion from your leader, especially when their producing the way Cousins has been all season. That very leader would be needed against the 8th placed Suns in Western Conference. Former Kings teammate and friend Isiah Thomas took over the fourth quarter to help Phoenix take the lead late in the game, tallying a Suns high 26 points. With just underneath three seconds left in regulation, the Kings leaned on the person that could handle the emotion of the moment-DeMarcus Cousins. Cousins received the ball at the free throw line, gave a pump fake and shot, and along with the whole arena, watched the ball bounce on the rim three times as the buzzer went off. The whole stadium stood in silence. With a shooters’ bounce, Sleep Train Arena erupted in excitement as the ball dropped in. Game time. 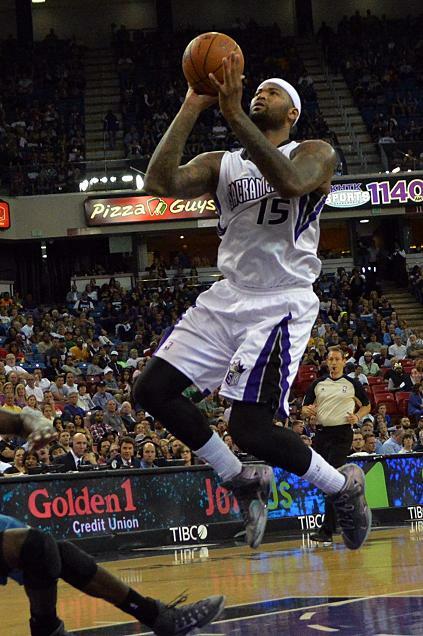 Cousins hit the game-winning jump shot on top of recording his 33rd double-double, which is second in the NBA. He finished the game with 28 points and 12 rebounds. By the way, the Kings defeated Phoenix, 85-83. Give me Cousins any day out the week. Yes he has some rough edges and you may not like his demeanor on the court, but one thing you will not hear are issues off the court. He’s loved in his community and he’s a beast on the court. That’s a combination I’d want from my star player.